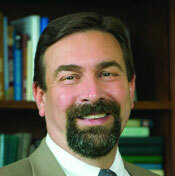 Anthony A. Frank is the 14th president of Colorado State University and a URA Board of Trustees member. He was appointed president of the university in 2008 and was also appointed Chancellor of the Colorado State University system in 2015. Prior to his presidency, he served as the university’s provost and executive vice president, vice president for research, chairman of the Pathology Department, and Associate Dean for Research in the College of Veterinary Medicine and Biomedical Sciences. Dr. Frank also currently serves as chair of the Association of Public & Land Grant Universities Commission on International Initiatives. He has been a member of several federal panels, including appointment by the U.S. Department of Commerce to the Deemed Export Advisory Council. He also has served on the editorial board of Toxicologic Pathology and as a member of the Colorado Climate Action Panel. Dr. Frank earned his undergraduate degree in biology from Wartburg College, followed by a Doctor of Veterinary Medicine degree from the University of Illinois, and a Ph.D. and residences in pathology and toxicology at Purdue University.